SHARE Once you've decided on a wedding date, be sure to let friends and family know so they can start planning and making travel arrangements if necessary. We'll help spread the word with these personalized Save the Date cards, that will not only announce your wedding date but will also give guests a small preview of your theme! 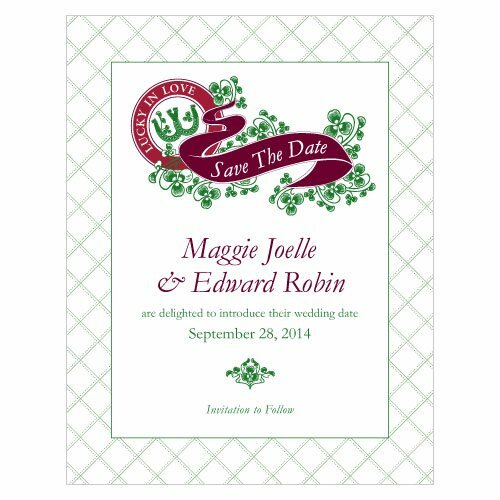 The 5 1/2" by 4 1/4" cards are pre-printed with the phrase "Save the Date" inside the ribbon, as well as the phrases "are delighted to introduce their wedding date" after the two lines designated for your names and "invitation to follow" on the final line. You can even add a special phrase inside the circle that surrounds our interlocking horseshoe graphic. Sold in a set of 8, each card will arrive with a text weight brilliant white A6 announcement envelope. When planning your Irish Wedding, count on Wedding Favors Unlimited for all your stationery items! 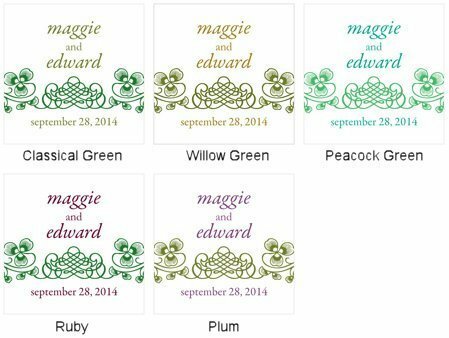 Search for personalized stickers, RSVP cards, favor tags and so much more.